The best laid plans often go awry. I can’t take credit for such an insight, but I have shared the experience many times. My life has been carefully planned and it has gone awry many times. Today I was going to accomplish many household tasks on my day off including the purchase of paint and supplies, scraping and painting a ceiling. It has been a grey, wet day with a constant cold breeze. Somehow, I did not want to venture outside and gave in to the barrage of imagined excuses. Rather than follow the schedule I have been curled up in a furry blanket, thinking and reading my old journals. I have not looked into those pages in years. I was actually happier than I remembered…and wiser…and more the…same. On reflection I believed myself to be infinitely more mature and filled with insights now than I was in my youth. The surprise to me is how consistently I have always viewed and processed the world. I know my external surroundings haven’t changed, but I felt that I had become so different with age. On some levels I have not changed at all! So, here I am again. The past month has not followed the plan so I have improvised…repeatedly. I took on the idea of the 31 Days Challenge on the spur-of-the-moment. This is not a thing I am experienced with, least of all being spontaneous. Well, I was cavalier with my to do list today, but writing a blog series, or committing to write everyday just when life and work were especially hectic, those are not the things I could easily change my mind on. The results prove my overly cautious approach to life sensible. I am too much like Elinor Dashwood to behave that way. I leave spur-of-the-moment plans to the Marianne’s of this world. Now that I am confessing my shortcoming and owning up to my plodding sensible nature I recognize that writing is how I process life. I have always been this way and I do not think I will ever change. Therefore, I must set up and adhere to a sensible schedule of posting. I do need to make more time to write. I promise to do so. I will post at least weekly. That seems an achievable goal. The idea of a series is attractive, but just at present; I think it best to wait. I have moved three rooms of my home. That seems strange. It feels exhausting and peculiar. 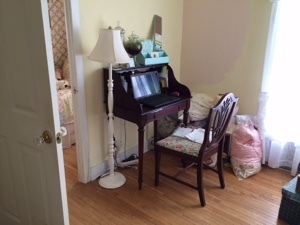 About three-quarters of the items, large furniture included, of three rooms have traded spaces. My study is now in a room of its own! It is upstairs [ (:sad face]. It is less noisy! It is a mess with boxes and piles of “stuff”. The “stuff” consists largely of blanket and comforters, Christmas decorations, etc. My office supplies are also in boxes or tragically filed in bookshelves downstairs. Some of you may recognize this as chaos of unworkable scope, others may find this perfectly normal. Whatever your level of comfort with confusion, I have found the process of getting to this point too time-consuming to allow for writing. I finally had the time to paint the peeling ceiling (that ought to be a poem) or write about how I feel about the move. Being true to myself, here I am. I am sitting with the wonky walls and other alliterations contemplating the nature of life and its deeper philosophical and theological implications. I am quite a piece of work. If you have read this far into this post I congratulate and thank you for your patience. I am leaving the Lectionary text schedule for an unknown future date when I can find enough time to do it justice. At this frenetic period I shall resume ramblings on life. An adventure of the spirit is just what I need. This may prove particularly inviting on the rare day off when a cold front has swept through. So from my topsy-turvy world I bid you adieu with todays’ thought from 2 Peter 3:9, “The Lord is not slow about His promise, as some think of slowness, but is patient with you, not wanting any to perish, but all to come to repentance.” Amen.